Nutella Cookies. Soft & fudgy with great chocolate hazelnut flavour! Nutella Cookies. 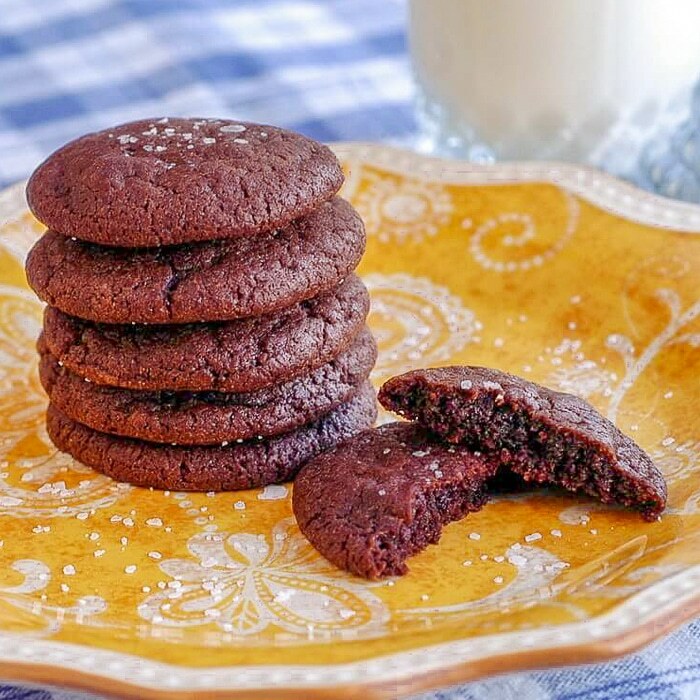 Soft fudgy cookies with great chocolate hazelnut flavour and the option of topping with a little pinch of sea salt if you like. We have a couple of 7th graders as guest chefs on the blog this morning; my daughter Olivia and her able assistant Kathryn. Olivia is a prolific baker of cookies at our house and she does have her favourites like Aunt Aggie’s Peanut Butter Cookies. She made those on this blog back when she was the tender age of nine. She has recently been supplying to her pregnant and peanut butter craving dance teacher. One of what used to be one of my “Dad”specialties was The Best Chocolate Chip Cookies. Olivia and her 6th grader brother, Noah have all but taken over that domain too. I don’t think I have made a single batch for several years. When the kids set out to bake cookies for a sleepover the other night, I suggested Olivia search for a new recipe to try. I understand why she settled on this Nutella cookies recipe. It has all the elements she would love. Like most kids she is very fond of Nutella. No surprise there. But perhaps not so typically, she absolutely loves those dark chocolate covered caramels with a little sea salt or fleur de sel sprinkled on top. So this recipe naturally appealed to her. They turned out to be soft, fudgy cookies with a good caramelized sugar crispness to the edges. They had a little salty counterpoint to the overall sweetness while letting the hazelnut flavour of the Nutella still shine through. The sea salt addition may not be to everyone’s taste but it is easily omitted and as Olivia did in a separate batch. The salt is easily replaced by a toasted hazelnut in the centre before baking, like she did in the second batch. Either way, this recipe is a winner and well worth a try. 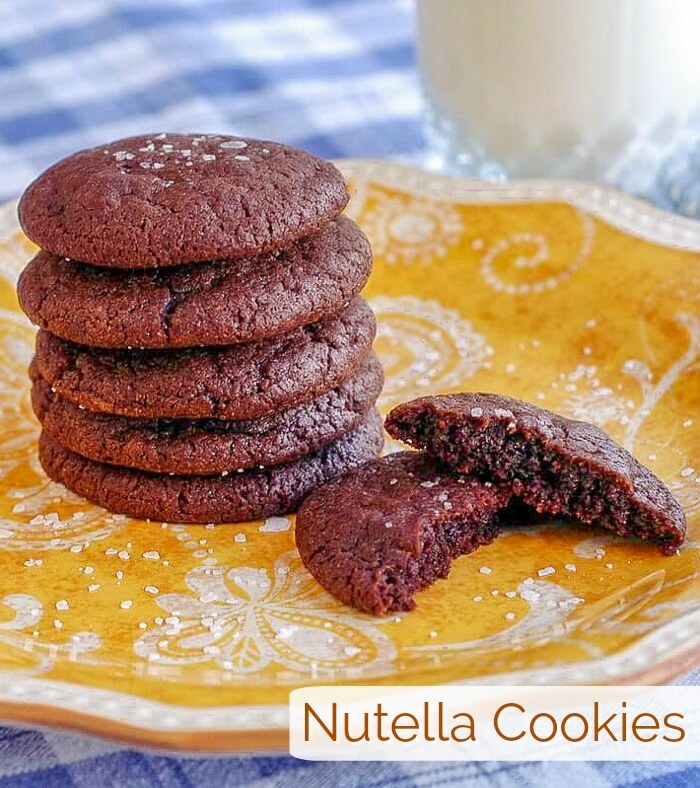 Like this Nutella Cookies recipe? Add the vanilla and Nutella and blend well. Fold the dry ingredients into the creamed Nutella mixture in three different additions and the milk in two separate additions, alternating between the two but beginning and ending with the dry ingredients. Chill the dough in the refrigerator for about a half hour before rolling it into 1 inch balls. Place the balls about 2 - 3 inches apart on a parchment lined baking sheet. Slightly press down the balls with the bottom of a water glass and sprinkle each one with a small pinch of sea salt (optional). Bake at 325 degrees F for about 10-12 minutes. Cool on a wire rack. These Sea Salt Cookies looks so inviting. You do have a good blog here. Yum! 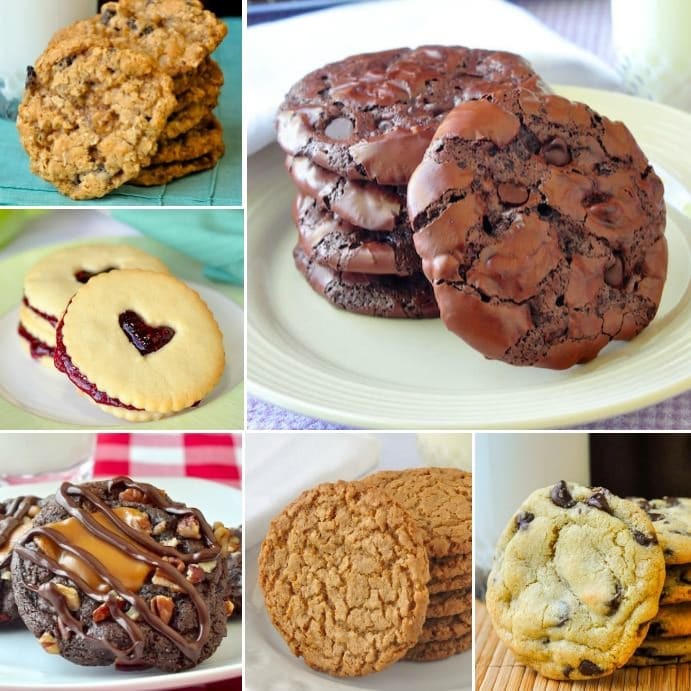 I’m going to make these tonight, and my mom’s going to bring them to her office tomorrow morning! (but I’ll save some for myself of course!) Looks delicious!